Are your holiday social media posts starting to feel as stale as a re-gifted fruitcake? If your brand shares the same things every year, it’s time to shake things up. Some 91% of companies say they send/post holiday messages. That means consumers’ social feeds and inboxes are completely flooded with themed posts by brands. To break through the clutter, it’s essential to try new approaches. One of the great recent additions to social networks is the 360° video option. This engaging format gives users the ability to pan/rotate and experience scenes from different angles (see Facebook’s overview here and some YouTube examples here). This season, you can use 360° videos to make your posts much more immersive. This can be done by filming a holiday-themed narrative with multiple storylines or by simply putting a camera in an interesting location (for inspiration, check out this this captivating Grand Central Terminal piece). An added benefit of 360° clips is that they allow your brand to capitalize on one of the hot technologies this year: virtual reality. With a dedicated VR headset, or with a simple add-on to an existing device, consumers can experience your videos by moving their gaze rather than a mouse. That’s truly a cutting-edge holiday content approach. Is your company holding big seasonal sales or other events? Do you have physical locations that you want to encourage visits to? If so, developing an On-Demand Snapchat Geofilter could be a worthy investment this holiday season (here’s a quick primer on how to do it). These overlays, which are provided as options within defined physical areas, are a fun way for consumers to share that they’re interacting with your brand. You can encourage visitors to take pics of their holiday gift hauls, or to just snap some silly selfies with Santa. The power lies in the exposure. Snapchat’s addictive filters are the ultimate example of modern word-of-mouth marketing. By providing a small, quick diversion, your brand can receive a big, long-lasting boost. Another interesting, engaging Snapchat tactic is to create “disappearing” posts that include offers/discounts. This can now be done via the Instagram Stories feature, too, which also features content that only stays live for a set period of time. While engaging on Snapchat/Instagram Stories can sometimes feel complex for brands, this approach is fairly straightforward to execute. Simply create some sort of coupon image and include it in a message that says something akin to: “Screenshot this snap and present it to the cashier by 12/1/16 for your special holiday discount!” (you can see an example of a brand taking this exact approach here). These offers tend to work well because they create limited-time urgency. Moreover, they work on two levels: disappearing coupons boost sales and also help to grow follower count. It’s a double win for your brand. It’s hard to overstate the amount of holiday-related brainstorming and sharing that occurs on Pinterest. According to data from the service, more than 38 million people save 92 million gift pins to the social network each year. While most brands understand that creating Pinterest content for their products/services can be beneficial, many don’t know that they can garner even more engagement with Rich Pins. This feature allows marketers to include key information, such as location data, purchase links, etc., directly in the pins. For companies, a major advantage of Rich Pins is that they help close the gap between browsing and action. By being able to directly push to e-commerce or a physical location, you can convert Pinterest holiday wish lists directly into visits and revenue. Marketers sometimes forget this simple fact: their staffs are full of interesting insights and stories. Consumers are often in desperate need of advice this time of year, and your brand’s employees might be well poised to provide that. With a Twitter chat, you can quickly and easily answer seasonal questions about everything from gift ideas to delivery, returns, and sales (check out this Twitter chat how-to guide for best practices). You also don’t have to be purely practical with your chat. A simple behind-the-scenes look at how your brand is tackling the holidays (like this example from FedEx), can go a long way, too. Sometimes all people want is a little distraction from the madness. Love the visual aspect of Instagram but wish you could display more photos and information in each post? Then Carousel Ads may be perfect for your brand this holiday season. These paid units allow you to include three to five images in one place. They’re perfect for showcasing a related set of gift ideas, especially for companies with beautiful photography/products. One of the best parts of Carousel Ads is that they also integrate calls to action. Each image allows for a short hyperlinked CTA (“Learn More,” “Shop Now,” etc.) that can go to an external page. It’s a great way to connect social media to sales by sending consumers directly to the website page/product page you want them to visit (check out this case study to see the ads in action). Finally, for many brands, the holidays are a time for looking beyond business goals and doing something to help others. If your company is participating in a charity event—a volunteering day, a gift donation drive, etc.—Facebook Live is a great way to showcase it (check out some best practices here). By live streaming the effort, you can highlight any non-profit partners you’re working with and recognize employees who are participating. Moreover, a Facebook Live post can help to inspire action. Consumers may see the stream of your event and want to engage as well. Ultimately, that’s using social media in the true spirit of the season. 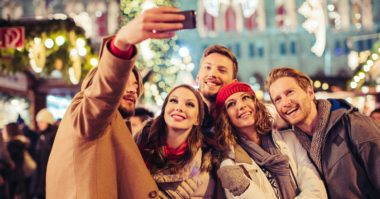 Unwrap the latest tactics in holiday social media marketing. Contact MDG Advertising today at 561-338-7797 or visit mdgadvertising.com.